Westport residents gather at the Sherwood Island Connector Park and Ride on Feb. 16 to clean up the littered property. WESTPORT — Where in town can you find piles of trash, old tires, drug paraphernalia and rusted appliances? Answer: the Park and Ride near the Sherwood Island Connector, where Westporters gathered recently to clean up the litter, a remnant of the state’s inability to maintain its property. Kraut, along with fellow RTM member Andrew Colabella, led a crew of about 15 town volunteers to clean the property for the first time on Feb. 16. He claims the state has failed to maintain the property, so residents must take up the charge. Many people leave trash and other garbage at the Park and Ride when the recycling center across the street gets full or has a long line, Kraut said. Plus, the property doesn’t have signs prohibiting trash and warning of punishment for litterers, which Kraut thinks contributes to the problem. 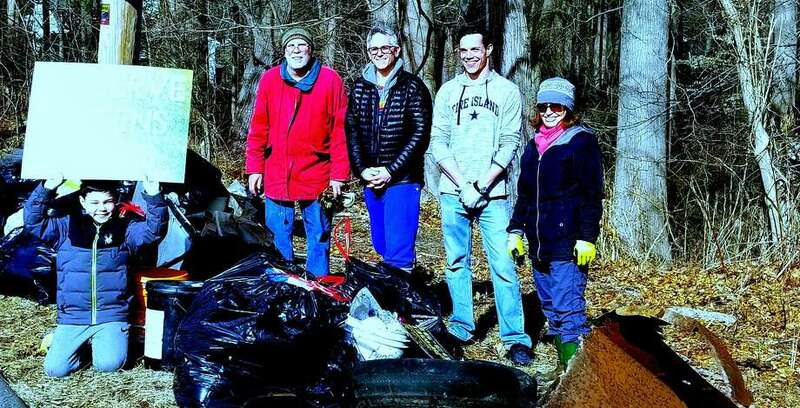 “We removed about 30 bags of garbage and a lot of bulky items — tires, rims, auto parts — lots of hazardous waste, and a lot of it is deeply buried,” Colabella said, noting the litter harms the adjacent West Parish Meetinghouse, a state archaeological preserve, and several brooks and streams which flow into wells where nearby neighbors source water. Contact Greg Kraut at greg@gregkraut.com to get involved in the Sherwood Island Connector Park and Ride clean-up. The origins of the clean-up effort go back two years, when Kraut moved to his Greens Farms home and noticed garbage and bulky items piled up at the Park and Ride and along the connector. Over the years, Kraut said, the problem has worsened as wild animals eating the trash became more prevalent. Kraut wrote on Facebook about the issue and contacted the state, which owns the property, who said the state Department of Public Transportation doesn’t have the funding or manpower to adequately clean the Park and Ride and connector. The state owns many Park and Rides throughout the state and their maintenance falls to the DOT, Kevin Nursick, DOT director of communications said. “Litter is a problem, and something more often than not we can’t keep up with because litter is a constant nuisance and absorbs precious resources to deal with it,” Nursick said. Generally, the state cleans up litter at Park and Rides once a week, Nursick said, but added the once-a-week schedule may be pushed back to allow more resources to flow toward higher priority projects. Park and Rides are often isolated and out of view from the roadway, and thus susceptible to litter abuse, Nursick said. In a period when the DOT has reached the lowest employee count in history and the impending insolvency of the state’s Special Transportation Fund caused $4 billion in cuts to DOT construction projects and rail and bus services, the challenge to maintain the Park and Ride properties is difficult, Nursick said. “We’re curtailing 4 billion in projects and bus and rail services, and then we have litter,” Nursick said. Nonetheless, Kraut, Colabella and the many residents who supported the clean-up effort want the state to step up and for local police and town officials to work with the state to ensure proper maintenance of the property. “The individual contributions of Greg and other residents is a good start, but this is an issue that should be addressed by state and local leadership,” said Mark Rubino, president of the Sherwood Island Development Association, which sits across from the park and ride. While Kraut wants the state to do more, he thinks residents have to step up as well to meet the demands of the state’s fiscal crisis.